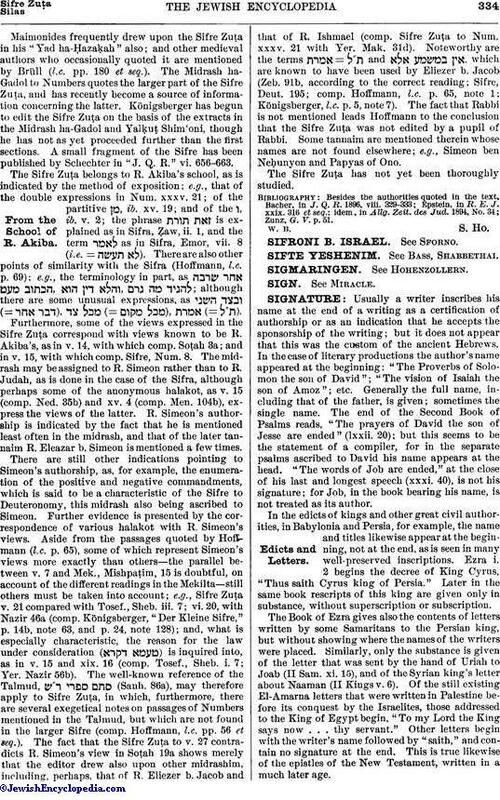 Usually a writer inscribes his name at the end of a writing as a certification of authorship or as an indication that he accepts the sponsorship of the writing; but it does not appear that this was the custom of the ancient Hebrews. In the case of literary productions the author's name appeared at the beginning: "The Proverbs of Solomon the son of David"; "The vision of Isaiah the son of Amoz"; etc. Generally the full name, including that of the father, is given; sometimes the single name. The end of the Second Book of Psalms reads, "The prayers of David the son of Jesse are ended" (lxxii. 20); but this seems to be the Statement of a compiler, for in the separate psalms ascribed to David his name appears at the head. "The words of Job are ended," at the close of his last and longest speech (xxxi. 40), is not his signature; for Job, in the book bearing his name, is not treated as its author. In the edicts of kings and other great civil authorities, in Babylonia and Persia, for example, the name and titles likewise appear at the beginning, not at the end, as is seen in many well-preserved inscriptions. Ezra i. 2 begins the decree of King Cyrus, "Thus saith Cyrus king of Persia." Later in the same book rescripts of this king are given only in substance, without superscription or subscription. The Book of Ezra gives also the contents of letters written by some Samaritans to the Persian king, but without showing where the names of the writers were placed. Similarly, only the substance is given of the letter that was sent by the hand of Uriah to Joab (II Sam. xi. 15), and of the Syrian king's letter about Naaman (II Kings v. 6). Of the still existing El-Amarna letters that were written in Palestine before its conquest by the Israelites, those addressed to the King of Egypt begin, "To my Lord the King says now . . . thy servant." Other letters begin with the writer's name followed by "saith," and contain no signature at the end. This is true likewise of the epistles of the New Testament, written in a much later age. Contracts among the ancient Hebrews appear to have been authenticated by a seal. The word "ḥotam" (seal) appears in Gen. xxxviii. 18; the patriarch Judah seems to have carried a seal suspended as though from a watch-guard. The use of seals points to written contracts, but it shows also that the inability to write was common among the well-to-do classes. The word appears elsewhere in the Bible, and the use and purpose of the seal must have been well known. The word for seal-ring ("ṭabba'at") is found only in connection with the edicts of foreign kings. But the Bible, in referring to written contracts (e.g., to the deed for land in Jer. xxxii. ), never speaks of the signature or the seal of the grantor or obligor, though it speaks of the attesting witnesses. The Babylonian contract tablets throw much light on the subject. Many of them bear the impress of a seal, and the verb "to seal" is in some of them used in the sense of "conveying" or "assuring." Simple acknowledgments of debt are in some cases signed at the end; but nearly all the tablets are attested by two or more witnesses, and this attestation seems to have given force to the contract contained in the body of the tablet. The Talmudic view is that the privileged contract known as the "sheṭar" (see Deed) draws all its force from its attestation by two witnesses, which is called "sealing" (Giṭ. i. 1). A signature by the party to be bound is not needed; and there is no hint in regard to wax or any other seal. An unsealed written contract ("ketab yad") may be proved against the maker by its handwriting or otherwise; but his name sometimes appears at the beginning or in the middle. 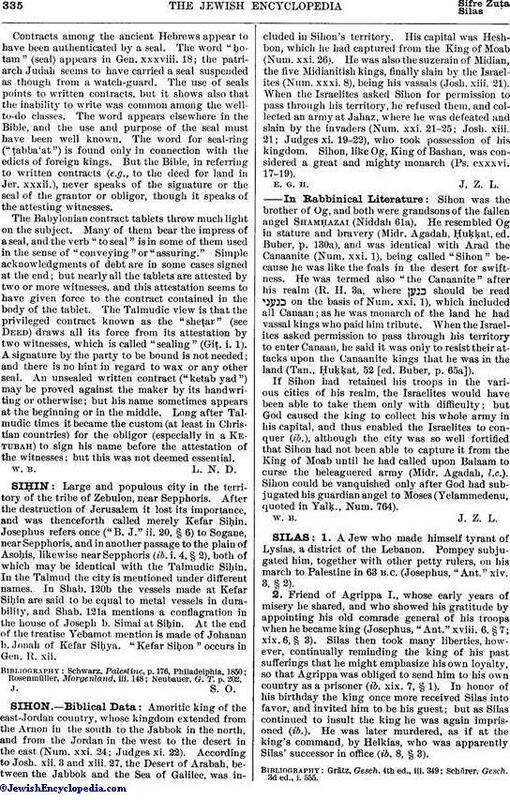 Long after Talmudic times it became the custom (at least in Christian countries) for the obligor (especially in a Ketubah) to sign his name before the attestation of the witnesses; but this was not deemed essential.